Social network apps are a primary attraction for many mobile users. However, many who use social networks aren't aware of the extent to which they are being tracked and profiled for surveillance ads. Further, it is increasingly obvious that services like Facebook, Twitter and YouTube are harboring and empowering a growing scourge of fake news, user harassment and radicalized hate speech. Apple has a unique ability to leverage the social concepts of public "shares, likes and follows" to create a premium social network where users aren't the product, where meritocracy flourishes and where users don't have to worry about their privacy or security. The company also has a strong financial incentive. By integrating and enhancing its existing offerings, it could increase the stickiness of its premium hardware platforms and leverage its roughly one billion users to boost its Services revenue--without relying on annoying, invasive user tracking and surveillance ads. Conversely, if it doesn't do anything it risks losing both revenues and users' attention. Outside of China, the most popular app on mobile devices is Facebook. 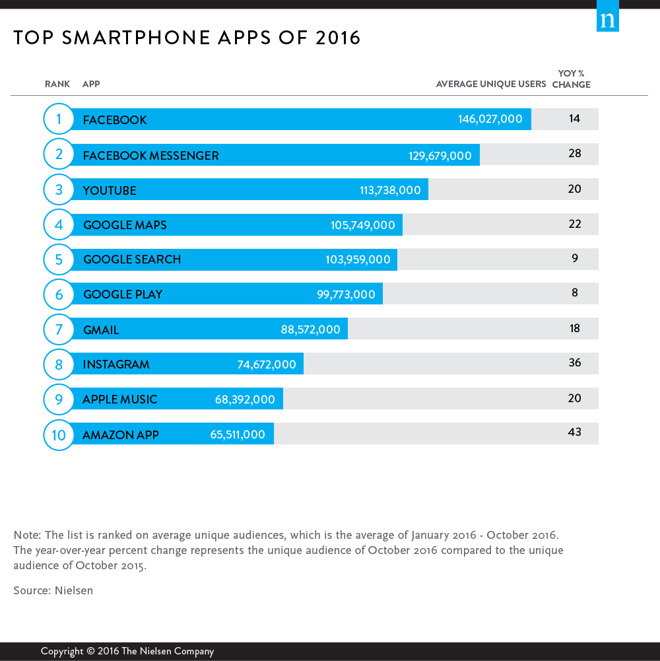 Five of the top ten apps are directly linked to social networks, and Facebook owns three of them. There's currently no immediate threat of Facebook leaving iOS; just like Google's services and Microsoft Office, the Social Network knows that it needs to serve iOS because Apple has the most valuable demographic of users. That hasn't always been the case. In the mid-1990s, Microsoft let its Office apps on Apple's Mac platform decay to shift focus to its productivity suite on Windows. In the late 2000's Google similarly made many of its new services exclusive to Android (including Maps Navigation), leaving iOS users out in the cold. Microsoft and Google have since made iOS central to their strategies due to the size and value of the iOS installed base demographic. If that were to ever change, however, their abandonment of iOS could gravely threaten Apple's ecosystem. Like Google and Microsoft, Facebook would love to kill Apple. Facebook has never left Apple's iOS platform, but it has repeatedly sought to snub Apple and partner with its rivals. Most recently, it aligned with Samsung to show off Virtual Reality and lend credibility to the company's Galaxy brand. That high-profile partnership slid sideways as smartphone VR ended up being the "biggest loser" of 2016, while Samsung's Galaxy brand literally engulfed itself in flames and acrid smoke. Facebook's snubbing of Apple isn't a new development. Back in 2011 it held up its native iPad app while throwing support behind Palm's ill-fated webOS tablet. In 2013 it attempted to launch HTC First as its Android "Facebook phone." 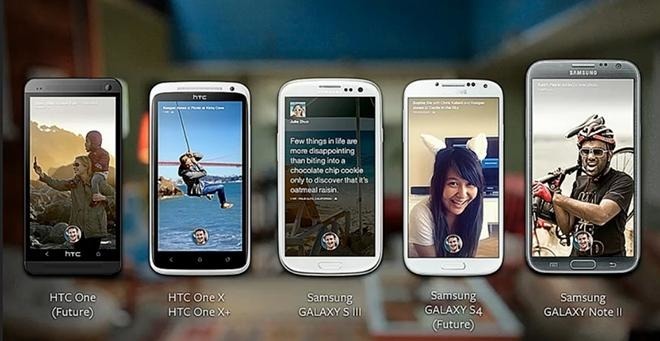 In tandem, the social network also debuted a Facebook Home on several Android phones. It was a clear expression of Facebook's determined intent to kill the iOS App Store and replace it with Facebook's social graph feed. Apple needs an offensive strategy in the realm of social networking to contain the rise of Facebook and its various analogs. At the time that Zuckerberg imagined a phone designed around Facebook rather than apps, Microsoft was similarly telling people that Windows Phone could free them from their terrible addiction of apps. Google was promoting web applets and browser extensions, in the hope that people would buy ChromeOS--the platform it actually wanted to sell--rather than cling to the native apps of iOS, Macs and PCs. Those narratives all failed, but they reflect the desperate efforts Apple's rivals made to undermine the strength of the iOS platform and its App Store ecosystem. Note that their ideological sycophants regularly announce that apps are dead and that both developers and users are sick (and tired) of apps and desperately want chat bots or voice UIs or whatever else Apple's rivals are trying to sell. Despite its storied experience in the formation of social networking, Apple is commonly considered to be inept in the field. The concept for the first graphical online service, AOL, originated in 1985 as AppleLink, a service initially provided to connect the company with its employees and sales and support partners. The public release of "AppleLink, Personal Edition" became America Online in 1989, launching an initial wave of mainstream users into networked social contact. 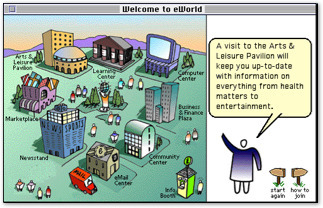 Apple later licensed its own version of AOL to launch eWorld in 1994. Apple's primary focus always remained tied to its revenue sources: initially Mac hardware, then mobile devices, iTunes media sales and, increasingly, App Store sales. Apple's role in social networking has largely shrunk down to being a platform for others' networks. As Facebook grew aware of the value of its social platform, Apple's platforms came to be perceived as a threat. Prior to the snubbing of iPad and iPhone detailed above, Facebook also dropped out of its 2010 partnership with Apple to integrate its social network with iTunes 10 Ping, leaving Apple with a dysfunctional stub of social features in its music store. Along with reliability issues that blighted the MobileMe service, the sloppy rollout of iTunes Ping helped give Apple a reputation for not understanding social networking at all. Only after repeatedly failing to isolate Apple and force it into a subservient role did Facebook finally agree to partner with Apple in Twitter-like social sharing integration with iOS 6 and macOS Mountain Lion in 2012. Facebook got some OS integration on Apple's platforms, and Apple got to look like it had a social network sharing strategy of some sort. Apple has never suggested any serious interest in taking over or competing with Facebook's position as a social network. Apple's own brief fling with advertising with iAd was abandoned after it realized advertisers didn't want its help to fix what users hated about ads, and after Apple itself realized it didn't even like being in ads. However Apple appears to be reversing the reputation that it doesn't "get" social. The company has optimized its advertising in social feed campaigns, operates its own YouTube channels and Facebook fan pages and gained attention for leveraging Twitter to enhance its user support services. Its recent iPad ad campaign even features actual Tweets as part of its "we're listening" messaging. Developing an integrated, exclusive, self-sustaining, sticky social platform would not only help sell Apple hardware but would also absorb some of the momentum that's fueling the ambitions of Facebook, Snapchat, YouTube and China's similarly very popular social platforms--a trend that risks upsetting or eroding the core value of iOS. At some point, if Facebook (or WeChat) or some other social network becomes the primary thing that users do on their phone, there's at least an opportunity for that social network to offer a Disruptive social device that could eat into sales of general purpose, high-end smartphones. While a lot of people have given some thought to the potential for Apple to rival Google in search with its own engine, matching Google at search is a massive undertaking (as Siri, Spotlight and Maps search attest with their inferiority). Copying Facebook would similarly be a huge task, but Apple doesn't need to duplicate everything Facebook does. It only needs to offer some real competition for users' attention in a few premium areas. 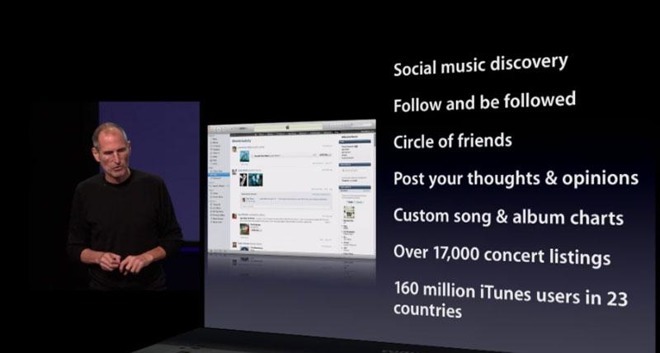 First take a look at the social network components Apple already has. The company's Apple ID ties together Messages, FaceTime, iCloud, iTunes and App Store accounts for over one billion users. That's not only a lot of users, but it's also a high-quality base. Messages and FaceTime have proven to be very attractive and sticky, keeping many iPhone users from even considering straying from iOS. Last year, Google showed off its own copies of iMessages and FaceTime, but then subsequently demonstrated its inability to reach its Android users with them. Apple doesn't have that problem. A few months after Google IO, Apple's WWDC unveiled big advances for iMessage, borrowing features and concepts from Snapchat, Facebook and other established messaging platforms. A few months later, nearly 80 percent of all iOS users have installed it. iOS 10 iMessages also added some original ideas of is own. In particular, Apple's new iMessage Apps leverage one of the strongest aspects of iOS: its Walled Garden ecosystem of safe, secure, inexpensive software apps, which users can install without wondering how much of their personal data, interests, behaviors and contacts are being collected and "shared" for surveillance advertising. The new iOS 10 iMessage apps platform not only helps make it "stickier," but also contributes toward Services revenues by selling third party apps and stickers. That's also a core foundation of Apple's other opportunities in social networking. Beyond messaging, Apple also has several content feeds: Apple Music's Connect looks the most like a conventional social media feed, but Apple also serves up News, Music and TV in content-oriented feeds (derived from various sources, algorithmic and human curated) in those three separate apps. What Apple doesn't have is the conventional trappings of a typical social network. There's no Apple ID "public profile" tied to a user's personal information, no connected mesh of identities or "friends" and no followable public feeds for listeners. Currently, when Apple thinks about "social networks," it appears to imagine iOS and Mac users sharing their own content (such as photos) to other social networks. When Apple enables users to "share" their own content using iCloud, it is targeted to a few known friends, not to a public sphere of "viral sharing" in the model of Facebook, Twitter, Reddit and so on. A Services-like model for social networking could give Apple a stronger platform and a new expansion for high-margin revenues. We generally think of social networks oriented around a social graph of users, but that definition is inherently tied to the surveillance advertising business model that Facebook, Twitter and most other networks have decided to rely upon, aware that sustainable numbers of people would be unlikely to pay to join such a network. Microsoft's LinkedIn is an example of a social network aiming to use a premium paid subscription model, but that hasn't resulted in spectacular profitability; Microsoft views it as strategic. Unlike Apple, Microsoft now runs a search engine and a social network, but both are largely just busy-work distraction. Apple doesn't need a hobby; it needs to develop a real social business. An App Store-like model for social networking could give Apple a stronger platform ecosystem and a new way to expand its high-margin Services revenues. Outside of its fantastically profitable iPhone, iPad and Mac hardware sales, Apple's other big business is Services. Now the size of a Fortune 100 company, Apple's $7.1 billion quarterly revenues from Services is approaching the total quarterly revenues of Facebook ($8.81 billion). Facebook talks a lot about its large numbers of users, but users are its product, not its customer. In 2016 Facebook collected $62 in revenue per user. Last year, Apple had revenues of over $215 per user--and earned over $45 per customer--if you count 1 billion customers. Apple's Services revenues largely come from App Store sales, where the company acts as a specialized merchandising retailer selling third party apps built using Apple's development API platforms. Apple has signaled that it wants to expand its sales beyond apps (and iTunes' music, movies, TV and related content). 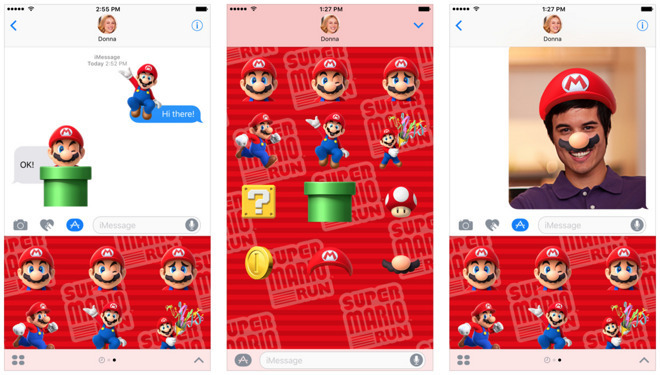 When it launched iOS 10, it introduced not only a new kind of apps tied to iMessage, but also Stickers. Similar to Ringtones, Stickers are not apps; they are artwork. Imagine if Apple were to expand its App Store business model to sell other creative user content. That would not only create an iTunes/App Store-like commercial market for creative content (such as users' photos, writing, videos and podcasts), but could also deliver that content exclusively among its own platforms, increasing and differentiating the value of iOS, macOS and the hardware they run. Users commonly share content to social networks (like Instagram, Facebook and Twitter) largely for vanity "likes." Companies use social networking to build audiences of brand attention. Imagine if sharing were paired with a stronger business model than surveillance ads and targeted marketing. Apple already has an ideal one: the App Store. Consider photos. Apple already has iCloud sharing features in its Photos app. You can create a shared album and send it to specific, known contacts. They can then view, comment and like your photos from within the Photos app. You can also share a public web link that offers access to anyone you share the link with. Apple's sense of "sharing" in Photos looks like more like network file sharing from the 90s than social network sharing from the current millennium. Last year, Apple introduced a new wrinkle on iCloud sharing. It created a new "shared" folder mechanism that let outside users access a user's explicitly-shared content. This new feature facilitated Shared Notes in iOS 10 and macOS Sierra, workout Activity sharing in watchOS 3, and iWork document collaboration in Keynote, Pages and Numbers. Imagine if everyone with an iCloud account also had the equivalent of a "Public folder," where shared content wasn't explicitly shared to specific users, but rather made available in a publicly shared feed anyone could view, follow, like and comment on. Except that instead of that being monetized by advertising (like Facebook or Instagram), this social sharing feed was monetized by a content store, like iTunes. Users could choose to publicly share their own content under a liberal Creative Commons style license, or could alternatively share their work in the style of a stock photography library, where other users or commercial entities could license their images for a fee, either for commercial work or personal use (such as making it their device Wallpaper or ordering a print). In iOS 10, Apple also introduced intelligent search (building on existing face recognition and location geotagging) to help users organize their photos. Using the same technology, Apple could do this processing in iCloud for users' publicly shared photos, enabling the public to find pictures of given subject, or of a specific location. This could be used to help turn social sharing into a stock photography service, where users can "follow" specific photographers or search their work (or the collective work of everyone they follow) to find specific images they'd like to purchase. 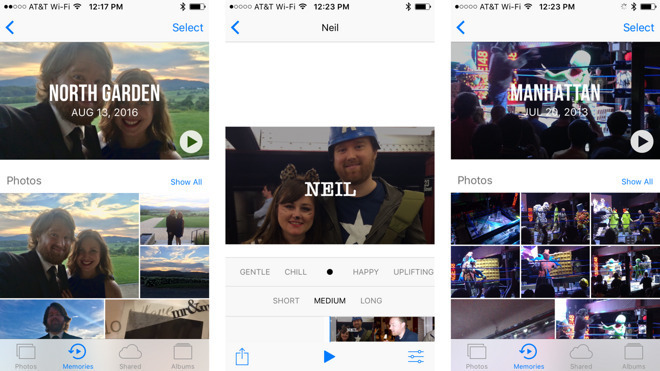 Apple's Photos app has also launched Memories, a feature for creating compilations of photos or movies tied to an event. 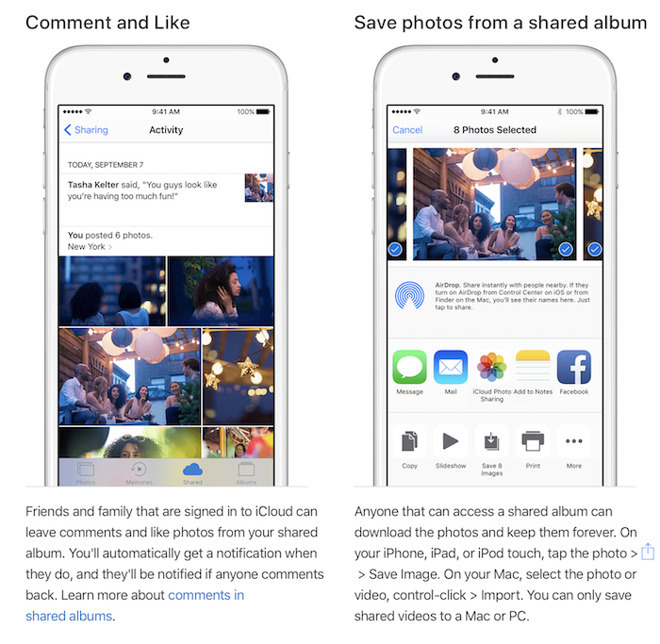 Apple already lets you share these as a shared album with specific friends, but if it gave users a Connect-like feed, individuals could choose to follow their friends (or a group, event or business feed) and see their publicly shared memories without explicit sharing invites. Both the former "commercial sharing" and the latter "casual sharing" would offer an ad-free, higher quality alternative to Facebook more in the model of Snapchat, where users explicitly share with users they meet and exchange usernames with, rather than being linked in a mesh of a social graph designed to hold users' attentions captive while they are profiled and shown ads. Being monetized by commercial licensing of images (and casual App Store "sales" in the model of iMessage Stickers; e.g. users could impulse-buy a photographer's Live Photo for their iPhone wallpaper for 99 cents) this more "social," public sharing model for iCloud could attract photographers the way the App Store attracts developers. That would also help finance the sharing infrastructure Apple would need to build. Apple could turn iCloud Photos into a way to buy (license) images, artwork, Panoramas, Live Photos, Portraits, 3D models, short animations and even movies, creating new "sharing economy" work opportunities for creative users on Macs and iOS devices. Paying a monthly fee for iCloud storage would be far more attractive if Apple also created an App Store-like market that helped its users sell their work, offsetting their expenses and potentially turning a profit on photos and films they capture. Apple's high-profile "Shot on iPhone" campaign has effectively drawn attention to iPhone camera capabilities. The company could leverage that visibility by creating an "up vote" that drives viral sharing of user's publicly-shared photos and videos. Across much of the web, anything you can create is easy to steal or plagiarize. By adding invisible digital signatures to users' work as part of the iCloud public sharing process, Apple could create a real, legitimate market for photography the same way it created viable markets for music and mobile apps. Outside of photos, images and movies, Apple could also develop iCloud public sharing to support an App Store-like market for writers, bloggers, comics, podcasters, analysts, and anyone else who has reports, research, articles, fiction or anything else to sell. 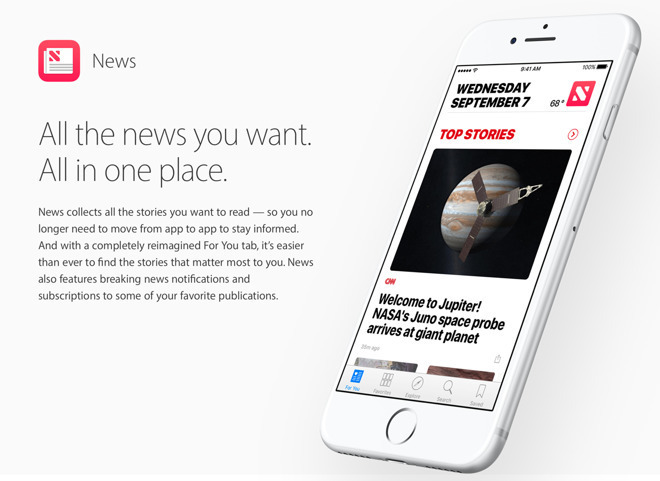 Apple News looks like a step in this direction. So far, using ads to monetize news and other writing has done a poor job of funding real journalism or other quality content. Google's paid placement business model for internet ads has optimized for clickbait, while devastating the markets for conventional advertising that used to support newspapers, magazines and other periodicals that once invested in investigative journalism and other professional grade work. Apple currently provides mostly free access to content in Apple News, and provides a way to share links to Twitter or Facebook or other user-configured social sharing services (although the implementation of these sharing links is problematic). It could expand upon this initiative by giving its users their own Connect-like feed of shared links and users' own content available for licensing or subscription. Imagine an Apple Connect feed that looks a lot like John Gruber's Daring Fireball or Philip Elmer‑DeWitt's Apple 3.0, which regularly post links along with their own brief comments and longer format articles. The former is supported by minor ads, the latter by subscriptions. But with Apple's monetizing efforts, both could be elevated above the fray of less informative clickbait that saturates the open internet, gaining the stature of software developers in the App Store. Apple has essentially done this for larger news publishers already; it could expand this to provide an ad-free way for more users to publish their content for money, monetizing bloggers and creative writers the same way it sells developers' apps. While there has been a lot of attention given to a few original television shows Apple has produced for Apple Music, the company could rapidly create a large portfolio of writing, illustration, photography, financial analysis and other content by simply inviting the best writers and other creatives to participate in a similar meritocracy supported by subscriptions and licensing. Like the App Store, there would be no guarantees that users would all make lots of money (the same way Google doesn't promise its ads will be able to effectively monetize everyone's work). However, by enabling creative writers to publish and sell their work in a functional market, Apple could earn a revenue cut while turning the notion of a "social network" from an algorithmic feed of fake news and surveillance ads into subscribed feeds of high-quality content. This is something Apple is uniquely capable of doing, as the history of iTunes and the App Store demonstrate. Efforts by Microsoft, Google, Samsung and many others to sell music and apps have paled in comparison to Apple. In addition to building a viable new iCloud Sharing market for photographers, writers and other creatives, Apple would also be building exclusive libraries of content for its iOS and Mac users, and increasingly sticky apps to absorb the attention spans of its users. Apple already has iOS and Mac "sharing" features that enable users to share photos, web links, and other items to Twitter, Facebook, Vimeo, or other configured accounts. 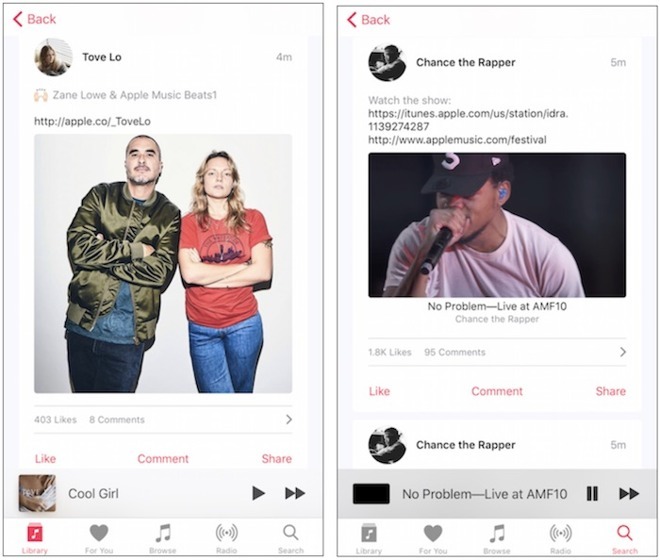 In parallel, it should also develop its own public feed based on Apple Music Connect, as it already operates for musicians. Users could create their own Connect feed, and decide whether to share content that looks more like a blog (family photos, vacation pictures and writing) or a fan page (links to creative or professional work for subscription) or a personal feed that's only visible to select friends (effectively what iCloud is now). Apple could create guidelines for publicly shared content that mirrors its App Store policies, keeping Connect a high quality place to visit. For privately shared content, Apple could establish the same kind of encrypted communications it uses for iMessages and FaceTime, reducing its involvement or liability in policing private content. It might make the most sense for Apple to initially, incrementally expand its existing Apple Music Connect to include a select number of developers, photographers, filmmakers, writers and other notable identities to build a more commercial social network with high-quality content, before tackling the problem of how to open the floodgates to the general public without infiltrations of spam, fake accounts and other abuse. Properly planned, Apple could deliver a 'Walled Garden" social network for professionals and aspiring creatives that's free of the incessant, anonymous harassment and abuse that is common on the web--and becoming a growing problem for services like Twitter. It would attract users capable of earning money from their work, further enhancing its user demographic. That, in turn, would attract followers to its higher value content, the same way people who love music left sketchy song-stealing sites for iTunes, and people who appreciate great apps went to the App Store rather than trying to find free web apps among the malware on the internet. Apple's chief executive Tim Cook recently observed that fake news is "killing people's minds," and the company's Internet service chief Eddy Cue expressed an interest in protecting users from false reports. By creating a market for moderate, professional reporting that's monetized by a meritocracy rather than by SEO manipulation, viral lies and outlandish headlines that aim to trick users into falling on ad clicks, Apple could be a force for real change in the erosion of journalism. Right now, Apple is largely just part of the clickbait problem, as it allows web publishers and even certain apps to force users into the App Store in automated attempts to profit from app install referrals. With a strong Connect service, Apple could also enhance its other Services-related initiatives. Filmmakers and studios could promote original content developed for Apple TV to their viewers. App Store developers could post more complete notes about their apps and new projects they're working on to Connect feeds their users could follow. By creating a social network without tracking, surveillance ads, publicly listed circles of friends and their corporate "likes," Apple could further differentiate its platforms and create new reasons for customers to buy its secure devices. It could also create new content markets for the very creatives that form an important backbone of its installed base. Apple could also use its market power to resist the erosion of high-quality journalism, while bolstering the demand for premium music and TV subscriptions without ads. This would further distinguish Apple as a premium brand in stark contrast to Microsoft's willingness to shovel ads into Windows 10, Google's lackadaisical approach to users security, privacy and hate speech and Facebook's intense effort to profile users and sell them to its advertisers as a product.